It hardly seems fair, after surviving all those terrible storms of January and February, that this huge oak branch should drop from the tree last Saturday (1st March)! The more avid bots and crawlers amongst you may recognise this apiary from a previous post of a sunny glade and the same hives with lots of honey on board. But weren’t we lucky! Our farmer noticed the branch had dropped and let us know quite quickly – it only broke one hive and we rescued the bees. 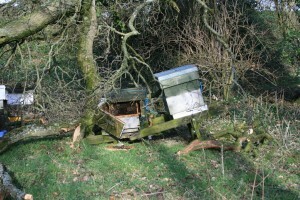 First sight was horrific but closer examination showed only one hive seriously damaged – a polystyrene one. Part of the branch landed on the roof, breaking the hives stand and the front wall of the poly box popped out under the pressure followed by the first frame. Somehow the rest of the frames stayed in place and the bees were actively coming and going when we arrived to rescue them. Another part of the same branch landed on a wooden hive (the white one near the centre of the main picture) and the metal top of the roof buckled a bit but managed to survive the blow intact. Polystyrene hives are certainly not as strong as wooden ones but in fairness, this one still had the strength to hold together somehow despite a blow strong enough to break the wooden hive stand. 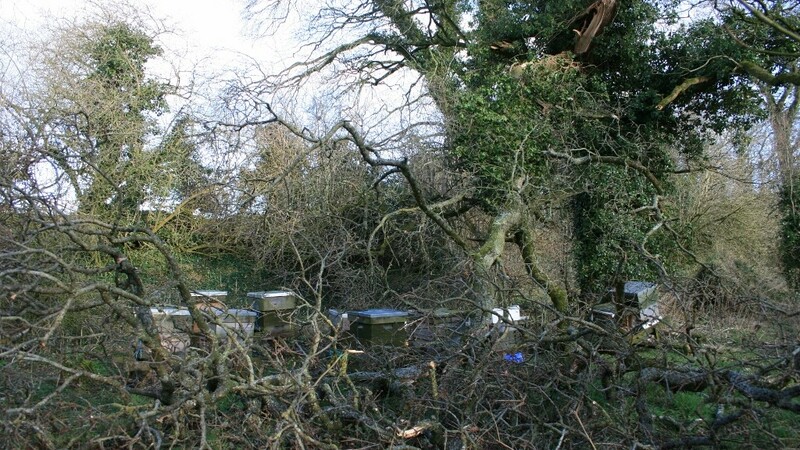 The moral of this story is to keep checking your hives throughout the winter because sometimes storm damage doesn’t come to full fruition till some time after the event.